We naturally strive to protect our families, relatives and the dearest people. A lot of instruments have been invented to solve this task. However people often forget about such a threat as radiation since they cannot feel or see it by themselves. So how we can be sure that we are safe? The only way is to use a dosimeter. Nowadays radiation dosimeter (Geiger counter) is a must-have for every person. This small device will provide you with precise information about the radiation levels. Dosimeters can measure alpha, beta, gamma or X-ray radiation levels. Every form of radiation has different penetration ability and can be more or less harmful for our bodies. Usually dosimeters for household use measure gamma radiation level, some of them can also measure beta radiation level. Alpha particles have low penetration ability and can not make harm until they get inside the body. Only certain professional devices can measure alpha-particles flux density. People receive some small doses of radiation from natural sources every day which do not harm our bodies. But when the radiation level increases due to some causes, it becomes dangerous as it can change the state of atoms of our cells. The processes of vital activity can be affected. Nowadays a lot of territories are contaminated with radionuclides due to technological activities of people. Radioactive isotopes can be located in soil, water, air, plants, animals, estate property, vehicles, objects of everyday use. People can never detect them without use of special devices. Radiation dosimeter helps you to check up the safety of house where you live, car you drive, clothes you wear, products you eat. Ensure that the items of your everyday use do not harm your health. ECOTEST has developed series of radiation measurement instruments to help people to protect themselves from radiation. The company has a 20 years experience and uses innovative technologies. Thanks to coordinated work of the best specialists the company became the leader in Ukraine and famous all over the world. We have over 20 official dealers abroad and export our products to more than 70 countries worldwide. ECOTEST TM is registered by the World Intellectual Property Organization in the rank of countries (USA, Japan, Australia, Russia, China, all countries of the EU etc.). The company produces Geiger counters and scintillation counters for professional market as well as for household use. All the personal dosimeters are compact, light and user friendly. They can with no trouble fit in one’s pocket, handbag or knapsack and will be ready to serve you anytime and anywhere. 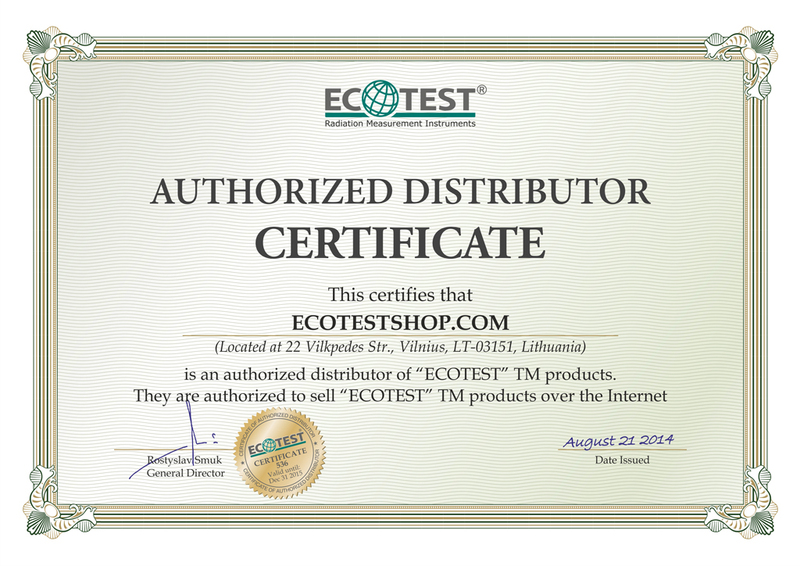 Ecotestshop.com is an online official distributor of the “ECOTEST” TM products based in Vilnius, Lithuania, with a full back office support. 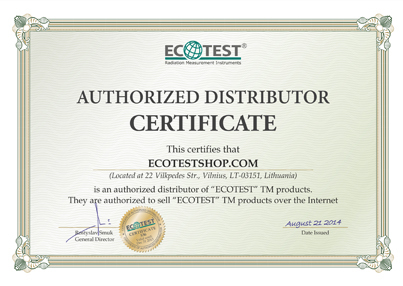 Here you may easily buy ECOTEST TM products at the lowest price!